Within easy reach of the city there are quite a few attention-grabbing natural spots, such as Antalya s beautiful waterfalls. Under the scorching summer sun, taking a trip to the waterfalls would be quite invigorating experience. The rivers here race to reach the Mediterranean either curling themselves into waterways above the land or zigzagging underneath the surface, and so, slopping down the Taurus Mountains, they eventually reach closer yet to the emerald green waters of the Mediterranean. When hiking to the falls, remember not to take too much luggage with you: even if it is cooler up in the mountains than on the coast, the sun is quite hot, so that, apart from the old reliable camera, it would be sensible of you to wear a pair of comfy shoes and have a spare bottle of water so as to avoid thirst. The almost rustic areas surrounding the waterfalls make up real picnicking and charming peaceful spots, so that, should you worry that you ll be taken down by hunger, there is no reason for you to despair: many recreation and relaxation places are meant for the tired tourist to catch up with his breath after a long walk in the woods. Enticing foods are steaming on the stoves of the restaurants down here, and so hungry or exhausted tourists can have a stop and sprinkle one of the delicious dishes with one of the numerous refreshing drinks on the menu. You should also know that there is an entire tradition among Turkish people to organize picnics downwards the falls at weekends, a time when friends and families come together to enjoy a good barbecue or the tasty grilled foods right in the middle of the wooded area, at the shadow of the evergreen beautiful trees so, if you happen to be nearby in one such day, feel free to join their picnic. There are as many as twenty waterfalls in the area, but three is the figure of the most outstanding ones. If you ask local people how to get to the Lower Duden Waterfall, they will probably tell you about the Karpuzkaldiran Waterfall, which is one and the same. Its being located in Antalya, near Lara Beach, makes it possible for tourists to reach it either by land, climbing down the flights of stairs from the top, or by water, in a large motor boat. 30 meters high above the ground there are the waters of the Duden River surging down the huge Taurus rocks in a foamy embrace with the Mediterranean waters. Keep your boat safe, within a 500m distance so as not to get hurled away by the milky bubbling river waters that will swing your boat away. Only 10 kilometers from the City, the Duden Waterfall is beyond incredible: tourists will get the chance to walk beneath the falls while looking out through the curtain of water. If you want to reach the Upper Duden Waterfall and are not joining a tourist group, take the main road, Cevre Yolu, and drive to Kemer, Antalya. Make sure not to speed the car, and look out for a brown sign, on the right side of the road, which reads Duden Selale. If you follow the road signs posted along the way, you are sure to reach the falls in just a few kilometers. Once here, remember to take photos of the ancient graves which are built just near the waterfall wall and date back from 3rd century BC. 19 km from Antalya and yet within easy reach, there is the Kursunlu Waterfall, right in the heart of an impressive pine forest, an already fashionable natural park protected by the law. It can be reached by car, driving towards Belek, Manavgat. Almost 4 km right of the airport there is a sign which reads Kursunlu Selaesi, wherefrom the main road branches off in two small roads. Take the one that turns right and a few kilometers later you'll arrive at the park. Just east of Antalya, within a 30 minutes' drive, there is Manavgat, a small town that has borrowed its name to the well-known Manavgat Waterfall. Gorgeous orange trees flank along the buildings in the center of Manavgat which is crossed by a street by the side of which there are signs that show the direction of the Waterfall. While passing by the street restaurants you might come across some smaller signs pointing to the direction of the waterfall. However, don't let yourself tricked by these publicity-stunts and know that these are used by the restaurant owners to lure their customers in, and as such, are intended for marketing purposes only. 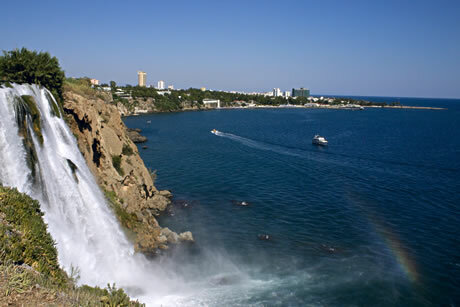 3 km north of Manavgat's city center, the Manavgat Waterfall falls low above the ground. Nonetheless, it is best to be at sky-scraping height wherefrom the milky white of the frothing waters can be seen as the water flow forcefully hustles over the mountainous pitches. Close to the falls there are tea gardens and restaurants sheltered away from the heat of the sun, true invigorating relaxation spots where holiday makers can have a minute's rest after a long and exhausting sightseeing tour. Should you be ahead schedule, make sure to take a boat trip up to Manavgat River and explore the surrounding areas even further.